Peter just made this Moran style Persian. I feel that Bill Moran would be pleased at the way Peter executed this knife. Just the Sterling Silver inlay took Peter 42 hours. The blade is Multi-layer San Mai. 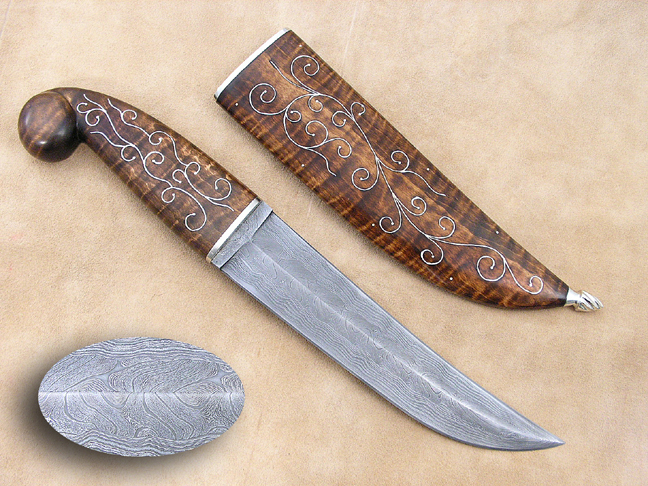 The handle and sheath are Tiger Maple. Ethical practices and the concerns of my customers are given first priority. If you are not satisfied with your knife, return it within 5 days in the same condition as you received it for a full refund, less shipping. Shipping and insurance is $15.00 in the USA, Canadian shipments $20.00.